There are many things you can take away from a summer walk in the New Forest: healthy exercise, the coconut smell of gorse, photographs of beautiful views. But there is one thing you do not want to take away and that’s a tick. Ticks are tiny brown or black spider-like creatures that feed on the blood of animals and sometimes people. Some ticks carry a bacterial infection called Lyme disease which can be nasty. It starts with a rash, develops into flu-like symptoms and can lead to arthritis or other complications. So where do ticks live, how do you avoid them and what should you do if you are bitten? The bad news is that ticks love the New Forest as much as we do. They like grassy areas in woodland and heath, especially moist shady spots among bracken and bushes. 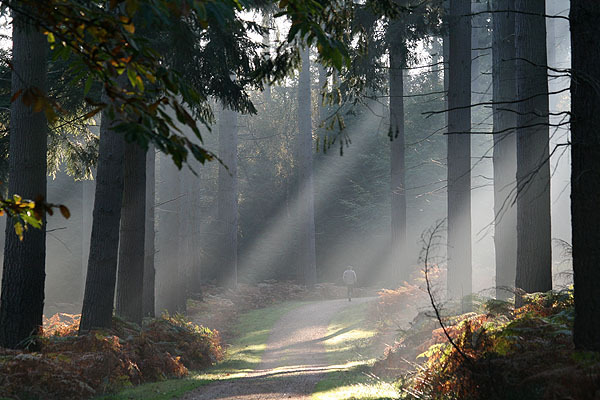 Not surprisingly the New Forest is recognised as one of their favourite places in the country and is listed on NHS and health protection websites. The good news is that ticks cannot jump or fly. They have to wait like passengers for a bus until an animal or a person brushes past the vegetation to which they are clinging so that they can attach to their skin. Ticks may prefer deer or dogs but a passing walker will do. The best ways to reduce the risk of tick bites are to stick to paths and avoid walking through dense vegetation, to use insect repellent and to wear long-sleeved tops, trousers tucked into socks and shoes or boots rather than open sandals. For dogs there are tick-repellent collars and tick treatments available from the vet. You are unlikely to feel a tick bite so it is worth checking yourself and your dog after a summer walk in the Forest. Examine exposed skin and skin-folds in particular. If you find a tick remove it as soon as possible using tweezers or a tick-removal tool. The knack is to grasp the tick close to the skin and pull upwards firmly and steadily without twisting. Apply antiseptic to the bite-site but see your doctor if you find signs of a rash or redness. Antibiotics are effective but early treatment is important. Fortunately Lyme disease is not common. There are 1,000-2,000 cases in the UK each year. But the New Forest in summer is one of the tick capitals of the country so a little extra care is wise. In fairness to the tick, the little critter is only the carrier of the disease. Ticks themselves become infected when they feed on mammals or birds that have the bacterium in their blood.